When you create a project, it uses a default base calendar to schedule work. This may be a typical Monday through Friday, 8AM to 5PM work week, or it may be something else that better matches your organization's work. Adjust the working times for the project calendar to meet your needs. Change to a different base calendar (24 Hours or Night Shift, for example). If your project's regular working schedule doesn't map to any of the available base calendars, you can change the working days and times for your project so that work gets scheduled appropriately. Tip: Are other projects using a similar schedule? Save your coworkers some time by creating your project's schedule as a new base calendar! Click Project > Properties > Change Working Time. Note: Using Project 2007? Click Tools > Change Working Time. With the calendar marked as (project calendar) selected from the For calendar list, click the Work Weeks tab, and then click Details. Note: Use the Exceptions tab to add holidays to your schedule. Select the day(s) that you want to change the working times for, and then choose whether you want them to be working or nonworking time. If you chose Set day(s) to these specific working times, use the From and To columns to set the working times for the selected days. Click OK to return to the Change Working Time dialog box, and then click OK again. Tip: Got a change in working days or times mid-project? Before clicking Details, give each timeframe a name on the Work Weeks tab, and add Start and Finish dates. Select the first timeframe to set Details, and then repeat the process for the next timeframe. If another base calendar already exists that maps to how you'd like work scheduled on your project, you can easily change this in the Project Information dialog box. Project includes a few different base calendars, by default, and your organization may have additional base calendars that an administrator has added to capture other common schedules. Click Project > Properties > Project Information. Note: Using Project 2007? Click Project > Project Information. In the Calendar list, choose the calendar you'd like to use to schedule work, and then click OK.
Tasks and resources can use their own calendars, in addition to this project calendar. Learn more. If you don't need a calendar anymore, delete it! When you are working with calendars in Project Professional, there are some different things that you can do to accurately account for working and nonworking time in your organization. The following sections provide examples for each kind of change and show you the steps that you must follow to make each change. Note: Steps in this article assume that you are already creating or editing a calendar. For more information about how to create a calendar, see Create a new enterprise calendar or Copy an existing calendar. Occasionally, you may have to turn a working day into a nonworking day. For example, if your organization observes specific days as holidays, you can turn those holidays into nonworking days. Project Server will not schedule work on nonworking days. Click the date on the calendar that you want to convert into a nonworking day. On the Exceptions tab, type a name for the nonworking day in the Name column. The Start and Finish columns are automatically populated with the date that you clicked in Step 1. Note: Although you can create multiple exceptions that contain a specific day, only the lowest-level exception will apply on that day. For example, you might have one exception that changes the standard working times for a month, and another exception that calls out a specific day within that month as a nonworking day. Because the single-day exception is at a lower level than the month-long exception, the single nonworking day exception is applied on that day. You cannot create multiple single-day exceptions on the same day. There may be times when your organization has to work on what would otherwise be a nonworking day. For example, say your organization participates in a convention each year that occurs over a weekend. You can convert weekend days of the convention into working days, so that Project Server knows to schedule work on those days. Click the date on the calendar that you want to turn into a nonworking day. On the Exceptions tab, type a name for the working day in the Name column, and then press Enter. Note: While you can create multiple exceptions that contain a specific day, only the lowest-level exception applies on that day. For example, you might have one exception that changes the standard working times for a month, and another exception that calls out a specific day within that month as a nonworking day. Because the single-day exception is at a lower level than the month-long exception, the single nonworking day exception is applied on that day. You cannot create multiple single-day exceptions on the same day. Click the row that you added for the working day, and then click Details. In the Set working times for these exceptions section, click Working times, and then set the working times for that day by adjusting the times in the From and To columns. Daily Set the frequency for these working times. For example, every 10 days. 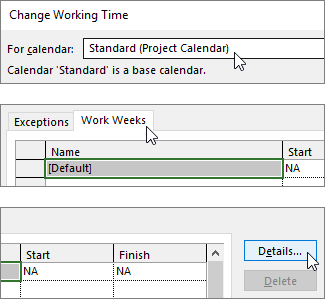 Tip: If you find that the working day exception is happening very frequently, you may find it easier to change the default calendar options under Schedule on the Project Options dialog box in Project Professional. All calendars begin with these default days and times. It may be easier to change the default calendar options than to set up exceptions that recur frequently. Weekly Specify how often you want the working times to recur, and on what day of the week you want them to recur. For example, every two weeks on Saturday. Monthly Choose what day of the month and at what monthly frequency you want the working times to recur. For example, day 15 of every third month, or the third Saturday of every sixth month. Yearly Choose on which day of the year you want the working times to recur. For example, August 21, or the third Saturday of July. In the Range of recurrence section, specify the period when you want the recurrence to take place, if appropriate. Start Choose the date when you want the recurrence pattern to begin. End after If you want the recurrence to happen only a set number of times, choose End after, and then type the number of instances when the working times should occur. End by If you want the recurrence to happen only during a certain time period, choose End by, and then choose when the recurrence should stop. While the specific days on the calendar may be accurately accounted for as working and nonworking, there may be working days that use a different time schedule than the typical 8-hour work day. You can adjust the working times for a specific working day so that work is accurately scheduled on that day. Click the date on the calendar for the working day that you want to adjust. On the Exceptions tab, type a name for the changed working day in the Name column, and then press Enter. Click the row that you added for the changed working day, and then click Details. Under Set working times for these exceptions, click Working times, and then set the working times for that day by adjusting the times in the From and To columns. Yearly Choose what day of the year you want the working times to recur. For example, August 21, or the third Saturday of July. If your organization has a specific work week (or set of work weeks) when the working times are different from the default, you can make those changes to the working times for each day in a work week, during a set period of time. For example, if your organization does not use the default Monday through Friday, 08:00 to 17:00 schedule, you can change the working times for each day in the work week to reflect your organization's accurate schedule. Click the date on the calendar where you want the changed working times to begin. On the Work Weeks tab, type a name for the changed work week or weeks in the Name column, and then press Enter. Change the date in the Finish column for the row that you just added, to reflect the last day that you want to include in the changed work week or weeks. In the Select day(s) section, click the day of the week that you want to use adjusted working times. Press Ctrl and click, or press Shift and click to select multiple days. If you want to turn the selected day or days into nonworking time, click Set days to nonworking time. 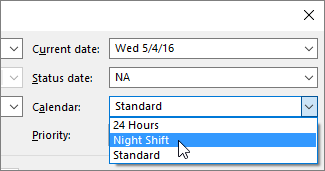 If you want to change the working times for the selected day or days, click Set day(s) to these specific working times, and then set the working times by typing in the From and To columns.